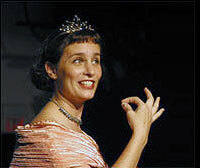 Nicole Pierce is a dancer, choreographer, installation artist, stand-up comic, concert pianist, piano teacher and the founder of her multi-multi-pronged art ensemble Egoart. It might sound like Nicole is one of those women who annoys other women — she's too good looking, too funny, too talented. But people of both sexes just really love Nicole. She is too much fun to be around for people to be daunted by her talents. 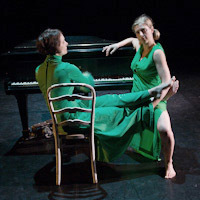 Here we see Nicole playing concert-level classical piano while dancer Julie Pike slithers around, over and under her. Egoart performances include everything from pure modern dance to very out-there dance to comedy. So if you need someone to dance, choreograph, create art, make people laugh, play or teach piano, shock you out of your comfort zone — or run an award-winning spelling bee — Nicole is your gal. Of course, in recognizing Nicole we must also recognize Bell the Dog, who sat patiently through many boring (by dog standards) photo sessions. 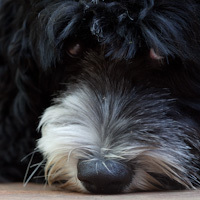 Bell is a sweet pooch who also put up with being occasionally terrorized by Fred the Cat. Bell also helps me get past the loss of my own beloved pooch Walter. And the tooth marks that Bell left on my lens hood? I like them — they remind me of the fun we had shooting this project and chasing Bell across the field when she playfully stole the lens hood from my camera bag.